Di apikorsim (“The Heretics”) was the first song that Lifshe Schaechter-Widman (LSW) sang for collector Leybl Kahn in NYC in 1954. He recorded approximately 100 songs sung by LSW over the next few weeks or months. LSW is my grandmother and the child one hears in the background is my then 4-year old sister Taube. At one point during her singing, she gets up and runs after her. 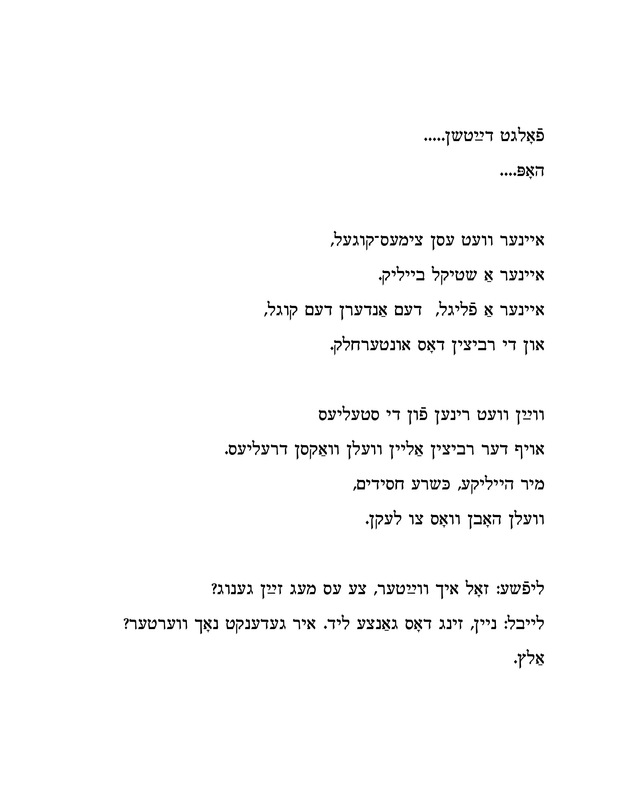 The spoken dialogue between LSW and Kahn is transcribed in the Yiddish text. In Shloyme Prizament’s book Di broder zinger (Buenos-Aires, 1960), he has a version of this song with the music on pages 110-112. 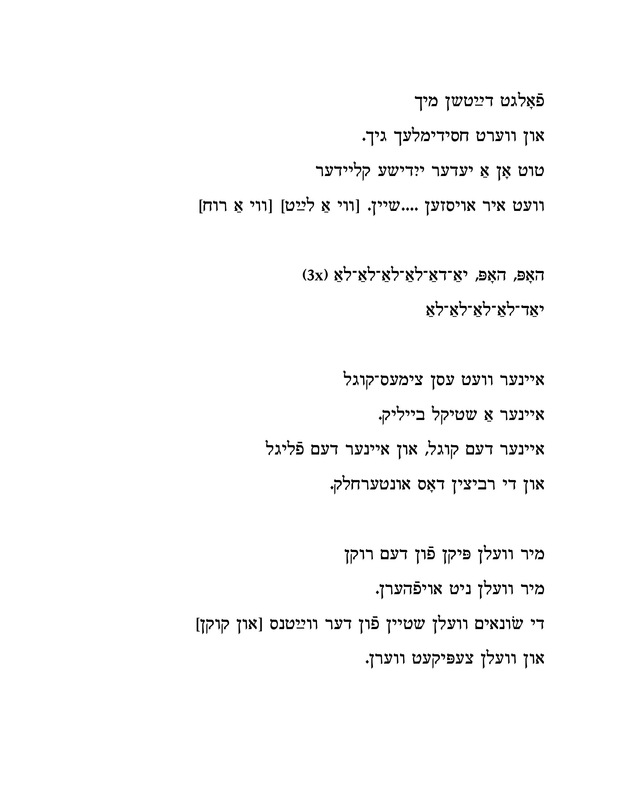 He writes that he wrote the words and music, and states that Pepi Litman recorded it. There is indeed a recording of Pepi Litman performing the song. 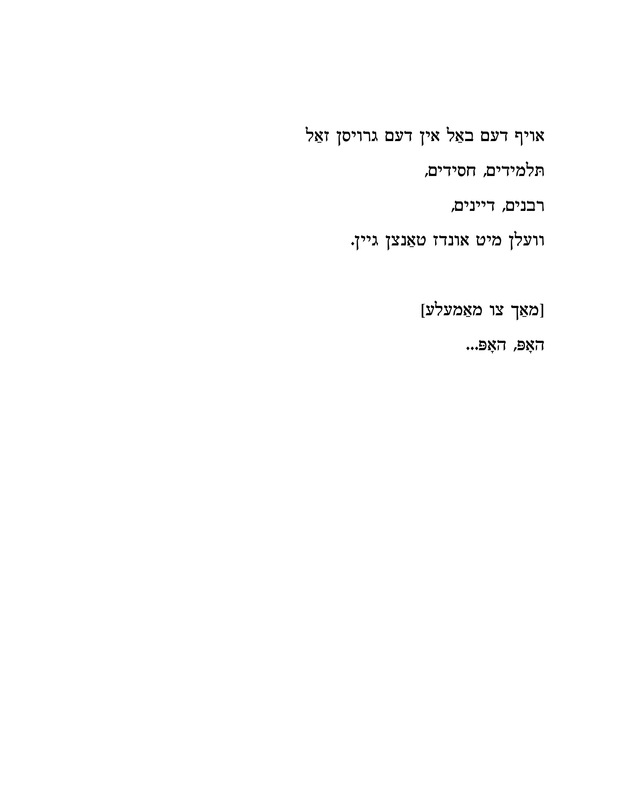 This book can now be read and downloaded at the Yiddish Book Center website. Shloyme Prizament was born in 1889 in Hibinev, Galicia and died in Buenos-Aires in 1973; his biography appears in the third volume of the “Leksikon fun yidishn teater”, pages 1873- 1876. Prizament was an amazingly prolific composer, songwriter, but I am not convinced that he wrote the song that LSW performs. The more likely scenario, in my opinion, is that he based his song on the popular current version that LSW sings. The song itself, a maskilic song mocking the Hasidim but sung in the voice of true believers, was a common genre. However, in Apikorsim the humor is quite vulgar. In songs such as “Kum aher du filosof” the irony is much more subtle. Ruth Rubin’s book Voices of a People has a nice section on maskilic songs (chapter 10). 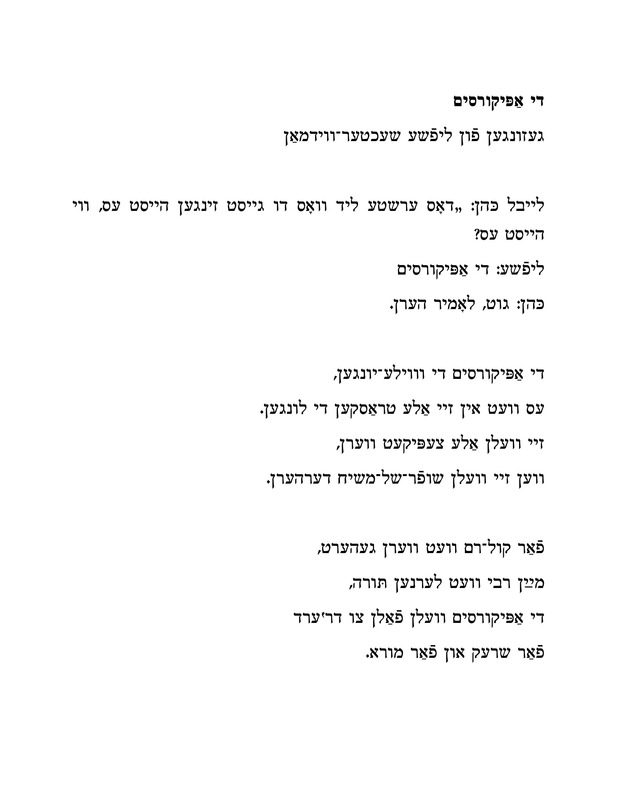 Rubin also prints Velvl Zbarzher’s song “Moshiakh’s tsaytn” (pp. 255 – 257) which is on the same theme as di apikorsim. A couple of comments on the words and rhymes of Apikorsim: “Daytshn” literally means “Germans”, but in the Yiddish of the 19th century, early 20th century, it referred to the Maskilim, the Jews who were assimilating and dressing like Germans – that is, as modern Europeans. You will also hear that in the refrain which begins “Folgts daytshn…” there is no rhyme for gikh. LSW sings sheyn. The implied rhyme should be rikh – the devil, and my mother remembers LSW singing it vet ir oyszen vi a layt or oyszen vi a rikh so i put those options in brackets. The listener would have understood the implied rhyme gikh and rikh. ven zey veln shoyfer-shel-moshiakh derhern. Their lungs will all rattle. when they hear the shofar of the messiah. der rebe vet lernen toyre. far shrek un far moyre. the rebbe will teach Torah. out of fear and alarm. un di rebetsin – dos interkheylik. another a piece of white chicken meat. and for the rebetsin – the bottom part. and we will not stop. Our enemies will stand from a distance [and watch]. one a piece of white meat. and the rebetsin – the bottom part. veln hobn vos tsu lekn. grapevines will even grow on the rebbetzin. will have what to lick. veln mit undz tantsn geyn. will all dance with us.